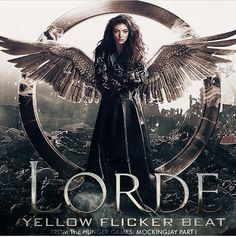 Lorde - Yellow Flicker Beat Lyrics from The Hunger Games: Mockingjay Part 1 - The lyrics to Lorde's songs from Melodrama and Pure Heroine. The song was written by Lorde and her frequent collaborator Joel Little. It was produced by Little and Paul Epworth. The track was released on 29 September 2014 and became another mega popular single for the lass from New Zealand. Lorde also contributed Everybody Wants to rule the world to the soundtrack of Catching Fire from the same Hunger Games series of films.